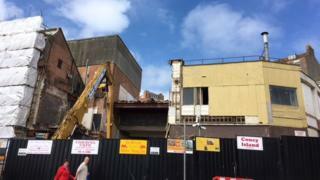 The demolition of a seafront theatre in Scarborough has begun following a long fight by campaigners to save it. The Futurist opened in 1921 and hosted many artists - including famously The Beatles in 1963 - but closed in 2014. Scarborough Borough Council planners decided last year to demolish the building at a cost of £4m. Campaigners had hoped to run it as a charitable trust but the council said it was not sustainable as a theatrical venue. A number of objections to the plans were made from the Theatre Trust, The Cinema Theatre Association, SAVE Britain's Heritage and the Twentieth Century Society, who said the building was a surviving example of the "super cinemas" built after World War One. The site is earmarked to become the home of a new attraction from Flamingo Land - a theme park in Malton, North Yorkshire. Cladding on the front of the building was removed in April and work has finally begun on knocking parts of it down.